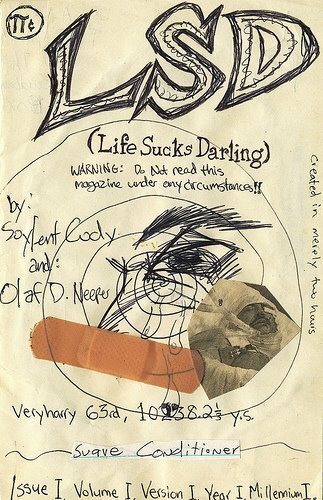 August 1995 – ACRONYM Inc.
Soylent Green & Olaf D. Neeper are actually Austin Rich & Syd Louse (of Cathead). This relic from 1995 was assembled in “merely two hours,” fueled by coffee and our increasingly psychedelic views of the world around us. 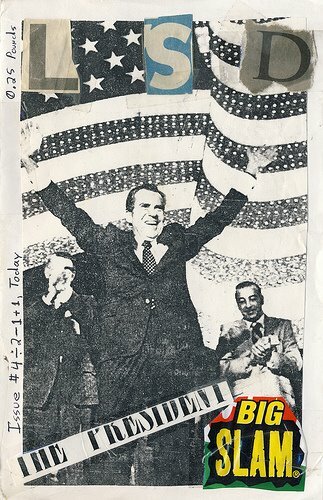 This one is worth the price for the Nixon Collage alone. Spurned on by a fan who wrote in to receive their free plastic spoon (stolen from McDonalds, late at night I might add), we went ahead and created a second issue, this time with Garl P. Snodgrass (kiisu d’salyss) in tow. The M.O. is pretty much the same, except this issue contains a few different versions of Pete The Junky Duck (for no discernible reason, I might add).